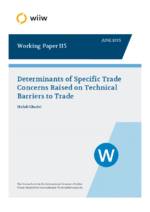 This contribution evaluates determining factors of Specific Trade Concerns (STCs) raised on Technical Barriers to Trade (TBT) notifications over the period 1995-2011. While multilateral and international agreements bind countries concerning the imposition of tariffs on imports, TBTs have become political instruments to conceal the true motivations of governments. The main legitimate reasons behind the imposition of TBTs are to increase environmental qualities and human health, or to improve market efficiencies. However, in addition to these reasons, governments are also in pursuit of protecting their domestic industries. Various effective factors of TBT STC notifications are considered in the econometric analysis using fixed effect Poisson (FEP) estimation as the main technique, and Poisson GMM as robustness specification. Results suggest that bilateral trade and tariffs are one of the forces of TBT STC notifications, acknowledging the protectionist behaviour of authorities. Moreover, countries with high quality of humans’ health-related environmental issues, and low environmental vitalities, are more likely to impose new TBTs. Overall, this study confirms the complex nature of TBT STCs affected by economic, technological, institutional, and health and environmental issues.